Description - When you think of playground surfaces, rubber, asphalt or rocks come to mind. We why not have grass under your playset? 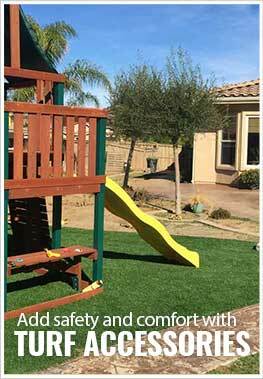 We now you can have the look and feel of real grass under your playset with our Playsafe Premium Turf Rolls. Paired with one of our Playpads, these turf rolls will ensure your children have a fun, safe time while at play. Our Playpad 5 provides you with a fall height rating of 2' – 5' and our Playpad 8 provides you with a fall height rating of 6' – 8'. Easy to install and maintain, our fake grass rolls are very safe and have been designed to withstand the high level of traffic found around playsets. These artificial grass rolls are made in the USA and are backed by a 10-year warranty. Recommended Uses – Playsafe Premium Turf Rolls are the perfect alternative to rubber, asphalt and rocks in your playground. Paired with our Playpads, these turf rolls will ensure that your children will have tons of fun while staying safe. Perfect alternative to rubber, asphalt and rocks. Fall height ratings achieved when paired with our Playpads. Can this be installed over asphalt? Our Playsafe Premium Turf Rolls can be installed over asphalt. For added comfort, we recommend placing one of our Play Pads under the turf. Do you have to add infill? We do recommend adding infill to our Playsafe Premium Turf Rolls. This helps to keep the blades sticking up and also helps to keep the turf in place. Even though we recommend using infill, it is not required. Infill can always be added after the turf has been installed. Our Playsafe Premium Turf Rolls will get warm in direct sunlight. To help combat this, we recommend either watering the turf every hour or so during the hottest part of the day or adding Hydrochill to your turf. This infill is unique in that it helps to release water into your turf to help keep it cool. All you have to do is water it every once in a while, and it will help keep your turf about as cool as natural grass. Can this be installed directly over rubber tile fall surfacing on top of concrete? Our Playsafe Premium Turf Rolls can be installed over any hard, flat surface. So, these tiles can be installed over rubber tiles or other surfaces like concrete, asphalt, crushed gravel, and the like. How deep does final prep need to be so it comes out flush with the sidewalk? Our Playsafe Premium Turf Rolls are approximately 1-1/2" thick, so you will need to make sure your base is about that far down to get your turf to be virtually flush with your sidewalk.